Kirby Corner is open for staff permit use. 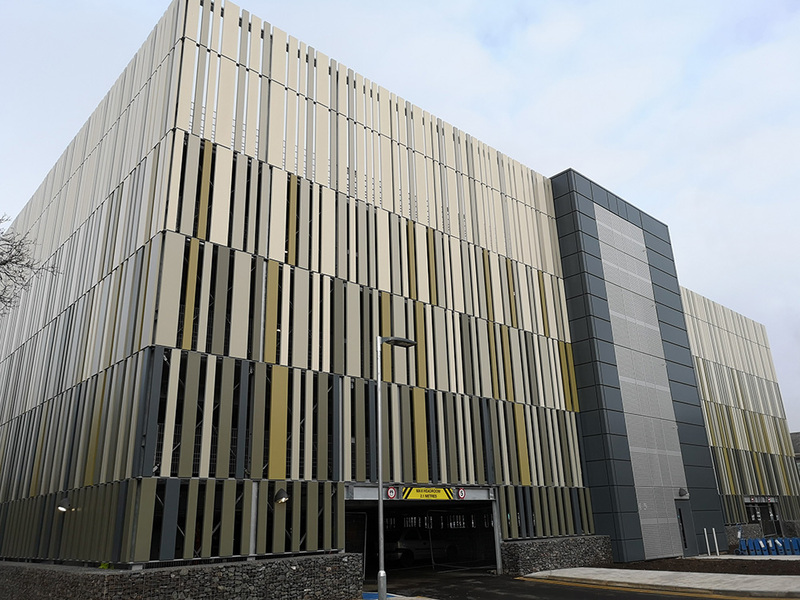 Read on for information about using the new car park, and for other parking updates as we continue the shift to a smaller number of large car parks around the edges of campus to reduce traffic and improve the campus environment. Parking attendants will be on hand in the car park for the first couple of weeks of operation to assist with any queries. In the meantime, here’s an overview of what you can expect from the new facility. There will be entrances/exits on Kirby Corner and Gibbet Hill Roads - the latter operating on left-turn only basis for improved traffic flow. There is automatic number plate recognition at entrances for ease of use for permit holders. You must ensure the vehicle you are using is your active vehicle on the permit system to avoid an automatic penalty charge. Check the vehicle you have registered before you use the car park by contacting carparking at warwick dot ac dot uk. There is dedicated motorcycle parking, plus cycle hoops adjacent to University House, blue badge spaces and car-share scheme spaces on the flat floor area adjacent to the multi-storey. Any blue badge holder must be registered for a Warwick disabled permit before using Kirby Corner car park to avoid an automatic penalty charge. Check you have registered by contacting carparking at warwick dot ac dot uk. "A" and "B" shuttlebus services that stop outside University House will also stop at Kirby Corner car park, adjacent to the multi-storey to ensure easy access to locations elsewhere on campus. This remains open until later in 2019 when work begins on the new Faculty of Arts building, though the top floor of the car park is no longer in use. More information will be shared in the Spring. The temporary overflow matting off car park 12 is now closed. The temporary stoned up car park on the Science park to the rear of i-House remains open for permit-holder use for the time being. Arrangements remain in place for parking permit holders with the additional Lakeside Village special permit. More spaces are expected to be available for pay and display users as permit-holders begin to use Kirby Corner. Kirby Corner car park is for staff permit holders only. PGR permit holders will not be permitted to use the car park due to tax implications. At Kirby Corner, electric vehicle charging units will be installed over the coming weeks. Work will also begin soon for an additional entrance off Lord Bhattacharyya Way to form a new pedestrian route to central campus. Electronic signage at the car park will soon be operational here and elsewhere on campus to provide live information to park users on the number of spaces available. 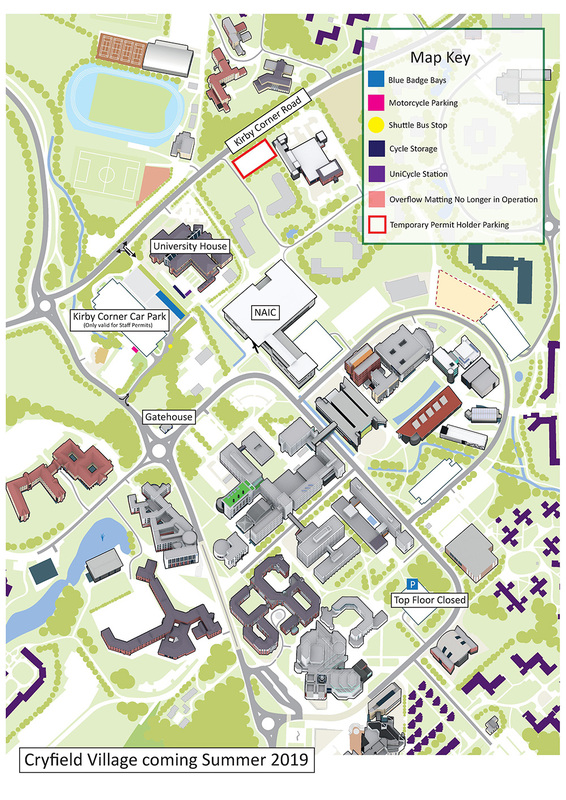 The Leighfield Road vehicle and pedestrian through-route from the southern edge to the centre of campus will be closed until April as part of final preparations for opening the Sports and Wellness Hub. Development work for Cryfield Village car park and work on pedestrian routes around campus is due to start later in the Spring term. There will be further updates for visitors to the Arts Centre later in the Spring, detailing alternative car parking provisions.